A little girl who is determined to strike a blow for nonconformity manages to arrive at school every day with a hairdo more outraegous than the day before. And each time, the cast of copycats grows and grows — until the day she threatens to shave her head! The strong female voice will speak to many, asserting the importance of individuality and independent thought. Full color throughout. 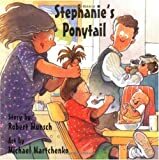 This entry was written by saurabh, posted on March 26, 2011 at 2:34 pm, filed under Ages 4-8 and tagged Annick Press, Health, Humor, Jokes & Riddles, Personal Hygiene, Robert N. Munsch, Science, Nature & How It Works. Bookmark the permalink. Follow any comments here with the RSS feed for this post. Trackbacks are closed, but you can post a comment.